Cobia is a firm fish that, when cooked, has a white colored meat. Its got enough oils to resist drying out but not enough to make it slimy and or too strong flavored. Its really good and should be more expensive than it is. I might say its closest in flavor and texture to Mahi Mahi. I loved the texture that these unsweetened coconut flakes added to this dish. Their flavor was very subtle but at the same time undeniably coconut-y. I paired this fish with sides of sweet, fluffy mashed butternut and savory, earthy shitaki mushrooms. The result: every texture and flavor you could ever want on your plate tied together with a punch of garlic. Spread butternut out on a lightly greased baking sheet and sprinkle with salt and pepper and half of the garlic. Roast for about 17 minutes in a 400 degree oven or until tender and beginning to brown. Add roasted squash and greek yogurt to a food processor and pulse until mashed (you can also do this by hand with a potato masher or fork). If the squash is too thick for your liking, add a tablespoon or two of water. Coat all surfaces of the cobia in coconut flour. Dip the cobia in the whisked egg. 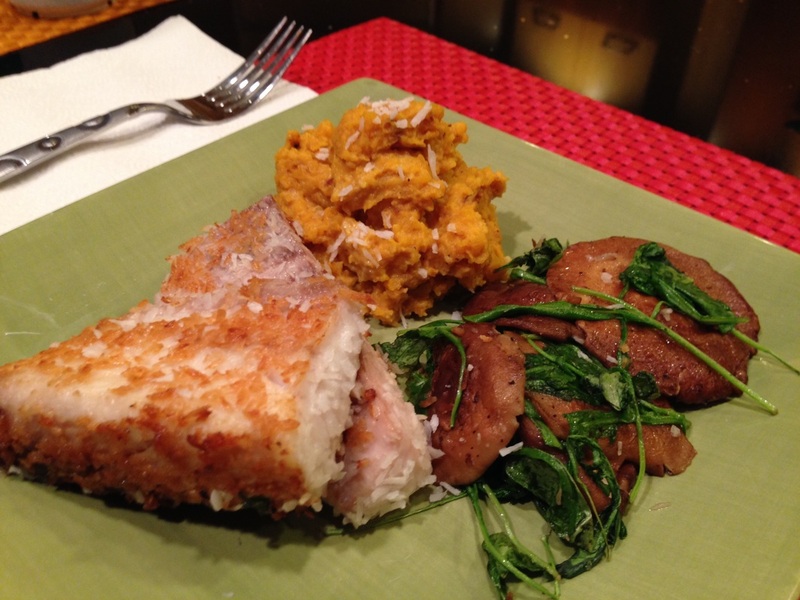 Coat all surfaced of the cobia in shredded coconut, saving a pinch of the coconut to garnish the plate. Sear in a lightly greased skillet for 3 or 4 minutes on all sides over medium/low heat (my pieces had three sides because of the way I cut them. If you're cobia is cut thinner it will cook through with 3 or 4 minutes of cooking time each on two sides). Meanwhile, sauté shitaki caps and remaining garlic in a lightly greased skillet over medium heat until tender. Season with salt and pepper and add arugula. Turn off heat but leave the veggies in the pan until arugula is wilted. Garnish the whole plate with the saved pinch of shredded coconut.